Everyone knows finding a dish that pleases the entire family isn’t an easy task, but I took on that challenge and successfully won. 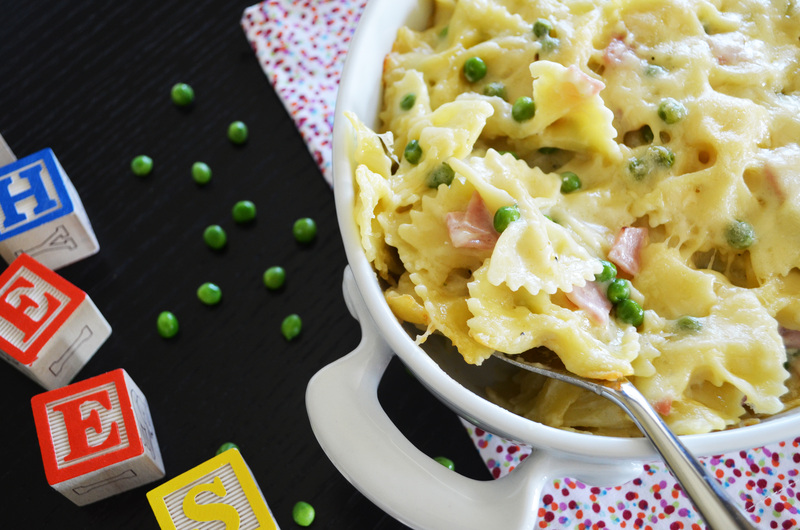 Kids Easy Cheesy Ham and Pea Bow Tie is a perfect option for anyone looking to try a new pasta dish. The kids will love the simplicity of the ingredients and is packed with flavor that adults crave. This dish can be a meal by it self or as a side with your favorite chicken and some delicious Dill Roasted Carrots. The next day I reheated the leftovers for my toddler and myself, boy was it just as tasty if not more the second day. Hopefully your family will have as much success with this delectable cheesy pasta as mine did. For this dish I used a specific cheese that I love from Trader Joe’s, Unexpected Cheddar that has a creamy texture and smooth taste. The cheese is somewhat like an aged cheddar but with a hint of tang to it. If you do not use this specific cheese that is fine, but let me tell you how lovely this unexpected cheddar cheese pairs with the ham and peas, it’s like they were meant to be. What a great recipe for kids! I just wanted to let you know I have a website (Simply Creative Recipes) where I showcase recipes I find and I am linking to this post if you don’t mind. Please feel free to submit any recipes to my site if you’d like. Thanks Alyssa! Will check it out! I think my picky son would love this! But he can be kinda picky about his pasta shapes…! I forget the Italian name for the pasta, but it looks like a wagon wheel. I’m wondering, since this pasta has less ‘surface area’ than the bow-ties, do you think I should use a bit more of it? Say maybe 20 ounces? Not that over-cheesy Mac-n-cheese is a bad thing….! Jill, I’m not sure, but I agree that more cheese is never bad!